Washington state is home to forests, large mountain ranges, valleys, lakes, rivers and farmland. Its diverse topography and weather make it suitable for four kinds of hummingbirds. Anna's hummingbird may be seen year round in the state, while the rufous, black-chinned and calliope hummingbirds are summer visitors to the state. The rufous hummingbird enjoys the West Coast life, traveling north to south with the seasons. In the spring, he'll venture into Canada and head south to Alaska and the Pacific Northwest for the warmer summer months. Despite his small size -- he weighs less than 1/4 ounce -- he's quite feisty and will chase larger hummingbirds from flowers and feeders. The male rufous has a bright orange belly and orange and green back with a vivid red throat. The female is less vibrantly colored. Forests, parks, yards and open areas provide his habitat, and he doesn't shy away from high elevation when he migrates to Mexico for the winter. 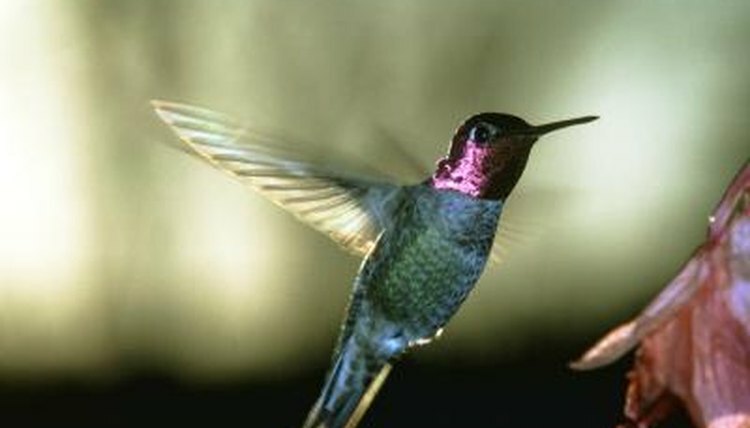 Anna's hummingbird is a beautiful hummingbird, sporting iridescent green feathers and a shiny rose-colored throat. This fellow is about the same size as the roufous hummingbird, with a stockier build. He's a common sight along the West Coast throughout the year, though he tends to stick to the western part of Washington state during the winter. He'll happily indulge in nectar from a feeder or flowering plant, and is commonly found in yards, residential areas and parks, as well as eucalyptus groves and riverside woods. The calliope hummingbird is North America's smallest bird north of Mexico, weighing 1/10 ounce. He's also the smallest long-distance bird migrator in the world, heading south to Mexico for winter. Washington is just one of the western states he favors, giving him a nice environment to choose from, since he likes mountain meadows, alder and willow thickets and forests. The male is green on his back with a white throat streaked with bright red. The female is less showy, with a dull white throat and a beige chest and belly. The black-chinned hummingbird is the least colorful of hummingbirds, with a metallic green back, white belly and black chin. He's distinguished by a bright bluish purple band under his chin. He's a bit smaller than the rufous hummingbird. Beyond Washington, he has an expansive presence in the West, ranging into the Southwest as well. This hummer will take to feeders, so he'll adapt to yard life. In more natural settings, he is flexible, ranging from lowland deserts to mountainous forests. He's happy as long as there are tall trees and flowering vines and shrubs. What is the Difference Between a Blue Bird & a Blue Jay?